FINALLY BACK IN PRINT AGAIN. 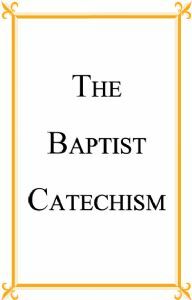 This is the 2004 updated edition of THE BAPTIST CATECHISM which was originally published by order of the Particular Baptist General Assembly that met in London in 1693. Dr. James Renihan has given us a "slightly modernized and edited version" that has proven very useful to Reformed Baptist Churches all over the world for the past ten plus years. In the opening words of the Introduction Dr. Renihan speaks for the Association of Reformed Baptist Churches of American, when he writes: "With great joy we present this Catechism to the church of Jesus Christ. It has a long and noble history, and we trust it will be of great usefulness to many more generations of Christians. We believe that an important part of the teaching office in the church is the provisionj of sound and solid theological materials for use by parents, and this little document wonderfully meets that need." C.H. SPURGEON said the following: "I am persuaded that the use of a good Catechism in all our families will be a great safeguard against the increasing errors of the times, and therefore I have compiled this little manual from the Westminster Assembly's and Baptist Catechisms, for the use of my own church and congregation. Those who use it in their families or classes must labor to explain the sense; but the words should be carefully learned by heart, for they will be understood better as years pass. May the Lord bless my dear friends and their families evermore, is the prayer of their loving Pastor." JOHN MURRAY, the great 20th century theologian, told the children in his Sunday School class the following about the surpassing value of The Shorter Catechsim: "Now everyone of you children should know the Shorter Catechism from the beginning to the end without a mistake by this age. Now that's without joking at all. At the age of twelve you ought to know the Shorter Catechism from beginning to end without even making a mistake. You don't know what you are missing! Get down to learning it, if you haven't already learned it! It will not only give you the most perfect human compendium of Christian truth that there is in the whole world but it will be the finest mental exercise and it will lay a foundation in your mind and in your life for a hundred other things as well as for true religion. The mere mental discipline of learning it with exactness down to each preposition is one of the best disciplines that we know of in this world in the field of education. The primary reason is to learn it for the purpose of having in your mind a comprehensive compendium of Christian truth, but even apart from that there are a hundred by-products. It will be invaluable to you through your whole life, and not only in this life but in the life which is to come. " GET COPIES FOR EVERY MEMBER OF YOUR FAMILY AND CHURCH. ENTER THE QUANTITY DESIRED AND HIT "UPDATE QUANTITY"